Once given the signal, Forces of Evil march to war! In the second week of the campaign I had a great pleasure to play against Tasman, who is responsible for rallying the local players so that we too can contribute to the global campaign. Tas is currently in the process of painting his brand new army, Orcs! It was thus the task for my Elves to stop the rampaging greenskins from doing even more harm to the world of Mantica. I am sorry for not recalling all the artifacts. I believe that Greatax may have had Elite but other than that I just don't remember. Hopefully I will be able to update the list later. 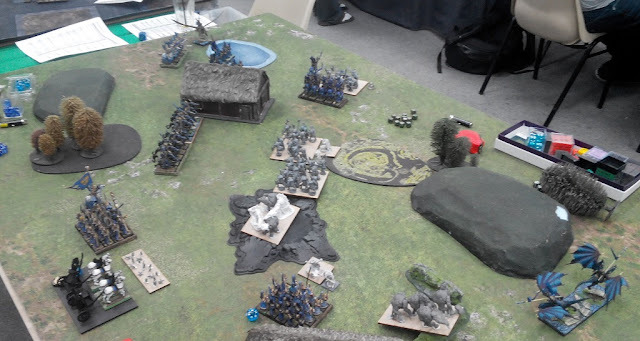 Infantry based Orc army with no ranged attacks but quite a few units so I could not count on number superiority. There are some nice ideas behind the composition of that army too! 2 x 6 Trolls - The toughest and meanest of the units in the army. Trolls are always a challenge to deal with. 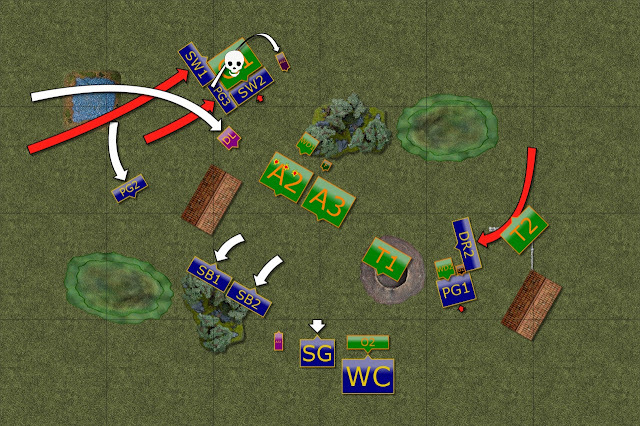 Everything will depend on where they are going to be deployed so I can either avoid them for some time or try to tie them in melee for a while and use that opportunity to deal with other units. 3 x 20 Ax - form main battle line. I think they are actually very solid infantry. With defense 5+ they are quite resilient and with army wide Crushing Strength 1 they can do some damage too. The main challenge would be to disperse them and take one unit at a time as I expected that they would be deployed together. 20 Morax - more specialized unit in the army, they hit better, have lots of attacks and better nerve but are also more expensive and not as well armored. With 3 regular Ax units though they should have an opportunity to be shielded from ranged attacks until it is time to unleash them against any foe. 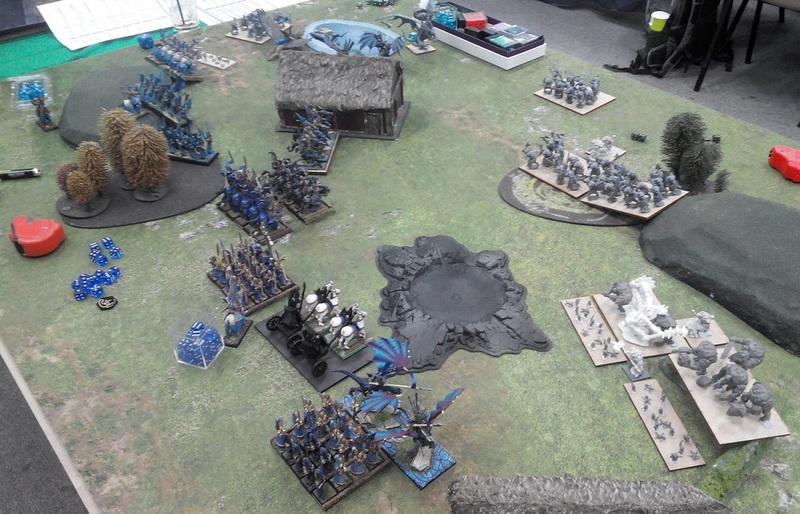 I would need to attack them first as I doubt any unit in my army can withstand their charge. 20 Greatax - another more specialized infantry unit in the army. They have Crushing Strength 2 and hit on 3+ so they can comfortably do consistent damage against heavy armored foes. They would be preferred target for my shooters but I doubted they would have been exposed easily to allow that. 3 x Orclings - living shield for the bigger cousins I expected that Orclings would form the first wave in front of Orc infantry units. 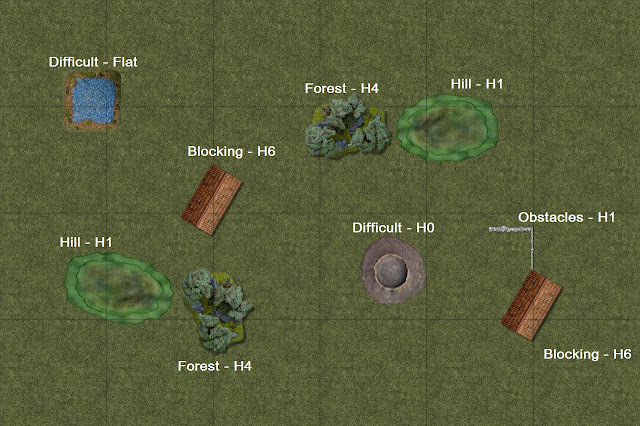 Trolls are tough enough on their own to be able to absorb the ranged attacks. It is always a bit tricky to deal with these as the enemy wants you to shoot at them or fight them so that he can get at you with the second line in good shape. Krudger on Winged Slasher - another heavy hitter in the army, this time with speed too. My aim would be to try and wound him in melee so that I would force some fight on the ground. If supported well I may bring some reinforcements to either tie him permanently or even rout him eventually. 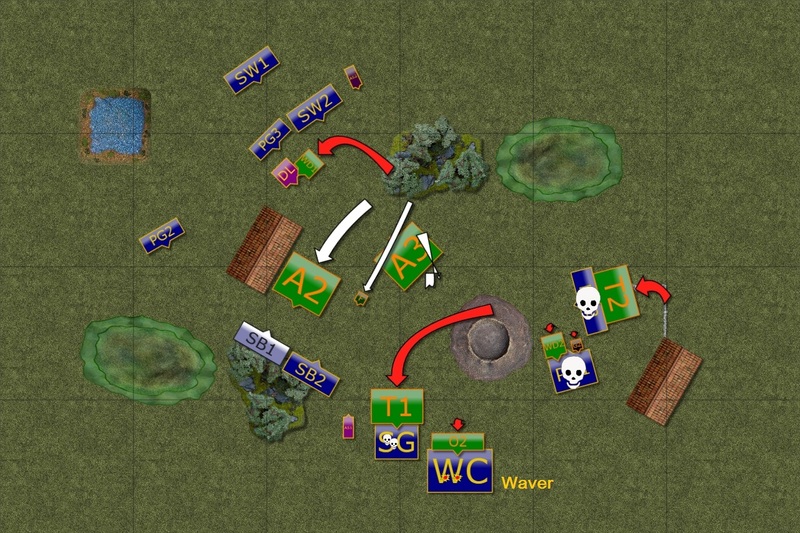 2 x War Drum - extremely useful support that turns Ax battle line into formidable green wall. Ax units get their nerve values increased to 15/17 if War Drums are nearby. It would be great to get them early but with low height I doubt I would even be able to see them. Another option would be to sneak one flying unit behind the enemy lines and then try to hunt them down. 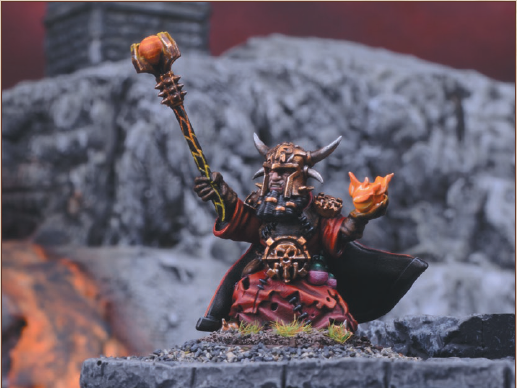 Grumtongue - living legend in the frame of the campaign he is a solid leader but his main impact is to allow units to charge further than normal. I would need to remember that and not let any enemy units charge me unless I wanted. Flagger - another source of inspiring presence, very important for the infantry based army. 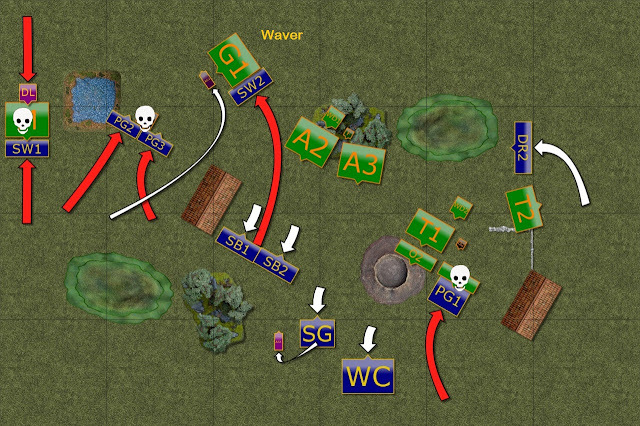 With Banner of Griffin and War Drum the units in the range can have really high nerve and combination of that with defense 5+ may mean a formation that is very difficult to shift. I would need to be patient in that game. 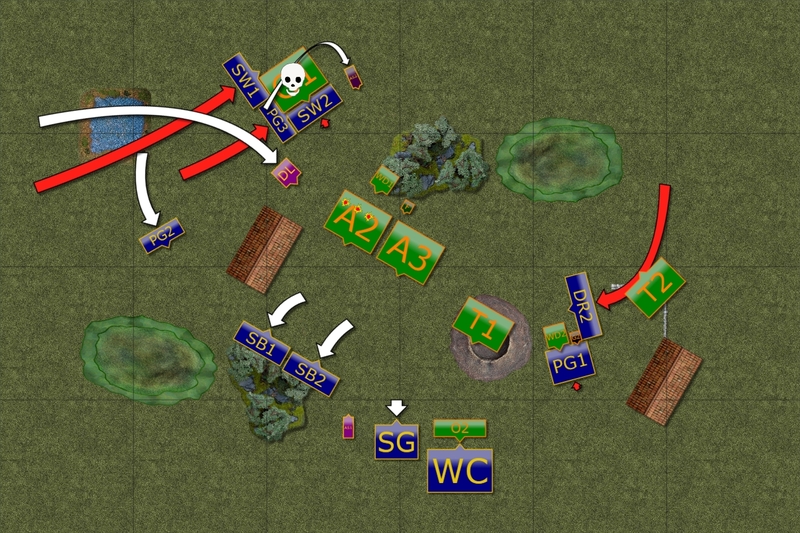 I have some shooting and speed advantage but if the infantry uses terrain well my shooting can be limited and some of my faster units would not hit hard enough. I expected a solid front line to approach steadily so dividing the units and isolating them would be the key to victory. Easier said than done, in particular when there are as many enemy units as mine. Eagle eye view over the battle field. 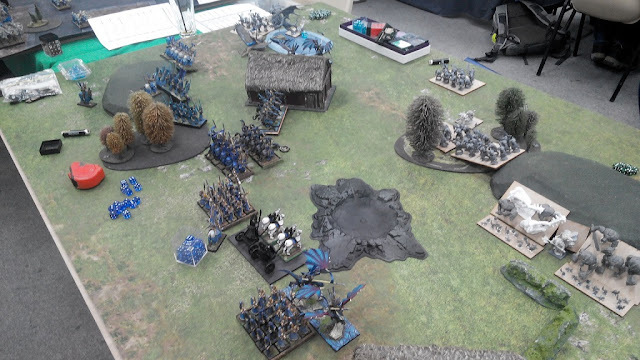 The scenario was Kill again and special rules did not apply to our armies either. I only knew that I would be first to move so was happy to deploy the shooters close so that they could move and shoot first turn. 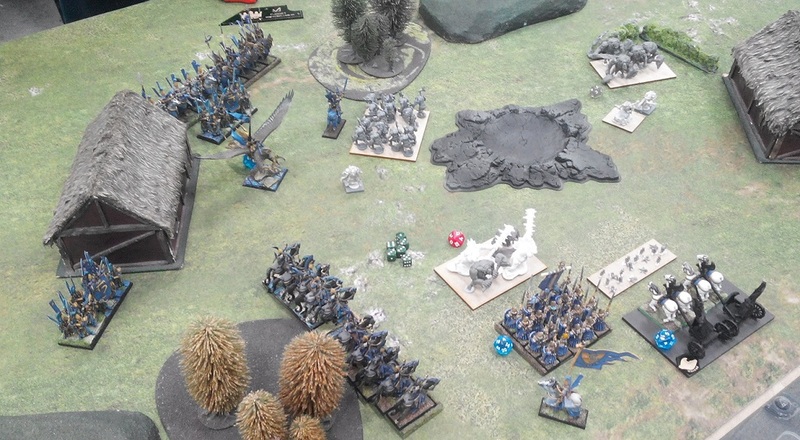 As soon as I noticed that Trolls deployed on one flank I wanted to delay this part of the enemy formation. 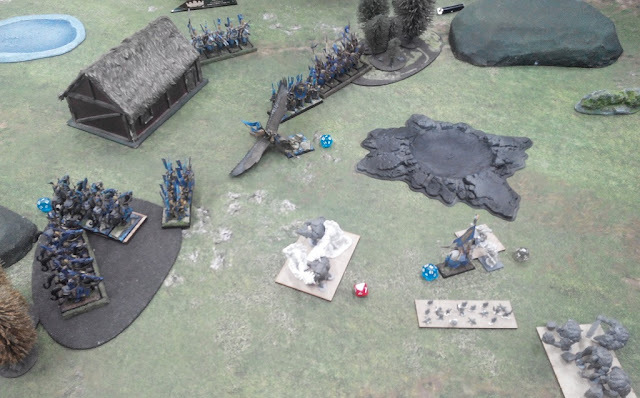 I did not know until my whole army was deployed where Krudger will be so I positioned my Lord in the middle to be able to fly to one flank or another, depending on the circumstances. 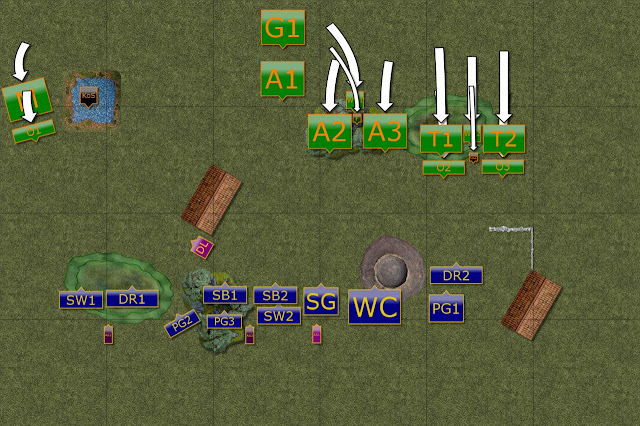 Krudger landed next to quite isolated units on my left flank so I decided it may be a good opportunity to intercept all elements there before slow infantry assists. Elves moved forward in order to get into range of the shooting and first arrows were aimed at the unit of Ax that could not benefit from the cover of the nearby forest. The effect was good as Orcs wavered under the fire. The battle line on the Eastern flank moved forward, with Trolls herding the Orclings in front of them. Orcs were a bit slower as they had to go through the forest. On the West Kurdger remained in the swamp while Morax marched forward a little too. Drakon Lord leads the attack and challenges Krudger to personal combat. Blows are exchanged and both Krudger is forced to continue fighting on the ground. Meanwhile, Elven shooters continue firing at the damaged unit of Ax and this time even the mighty Orc warriors are routed. 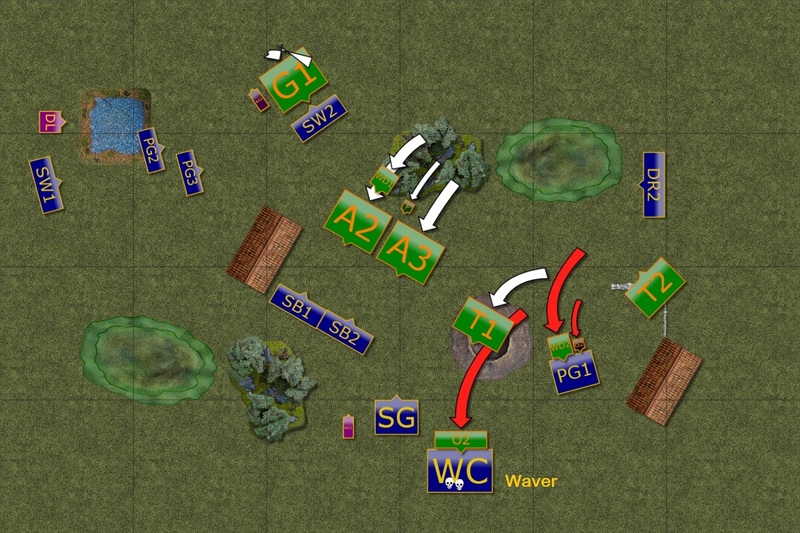 Trolls maneuver over the obstacles. Krudger chooses Drakon Riders as a target. 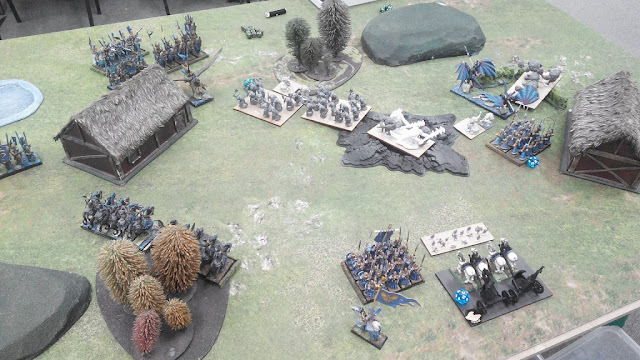 Elven Drakon Riders landed a bit too close to Krudger who chose them to be a target of his attack. However, they hold their ground for now. 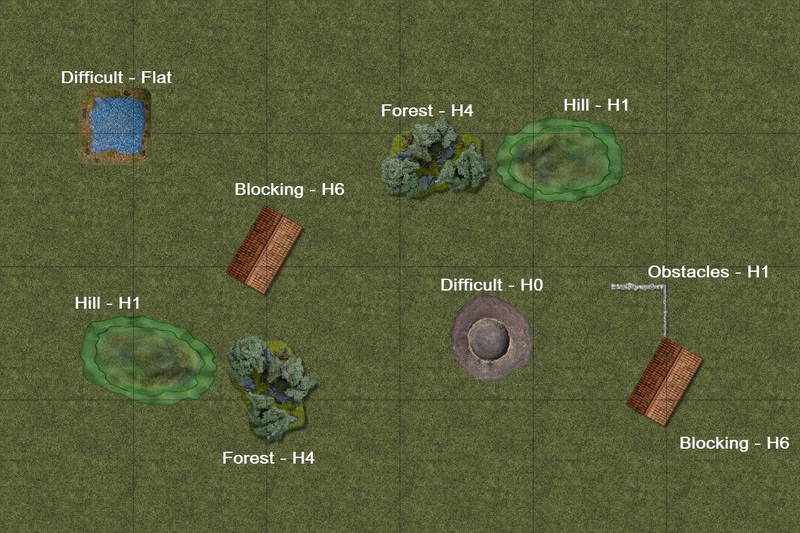 The units in the forest are reluctant to leave the protection as they saw what Elven arrows can do. However, Trolls are not worried about such nuisance and keep pressing forward. 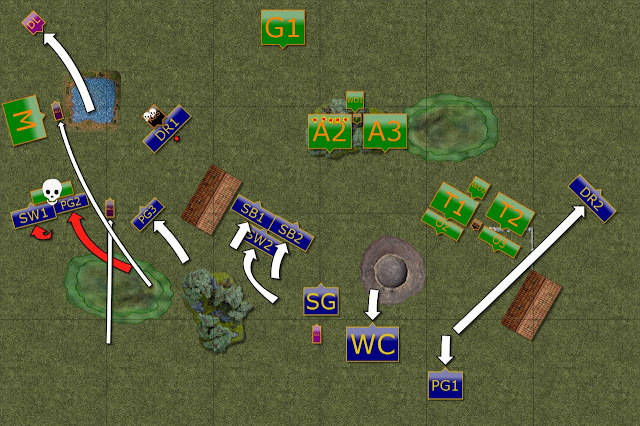 Elves advance on the left flank. 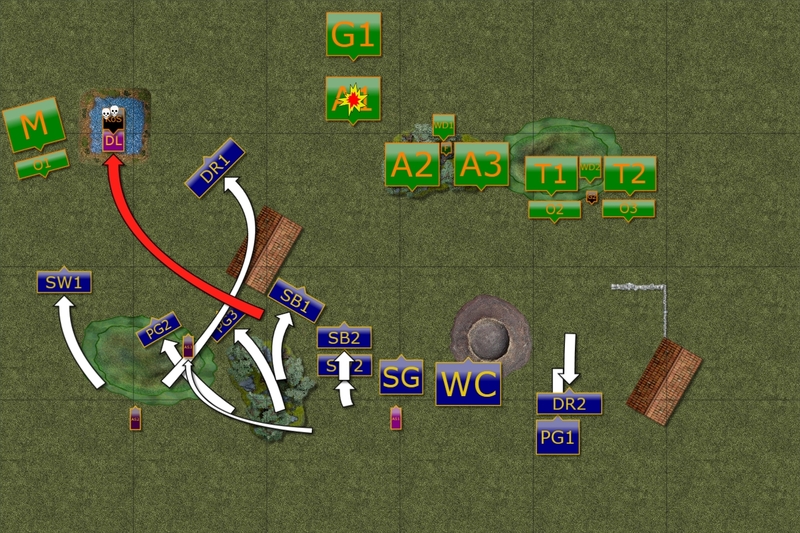 Elven units attack on the left flank to remove Orclings and to get to positions for another attack, this time more powerful. The units in the middle start shooting at a second regiment of Ax but the protection of the forest as well as necessity to re-arrange the formation makes it much less efficient. Krudger and Morax regiment rout their opponents and reform to face new foes. Greatax regiment finally moved towards that area too in order to help against Elven attack. Orc units keep advancing towards the Elven lines steadily, although difficult terrain slows down the approach. 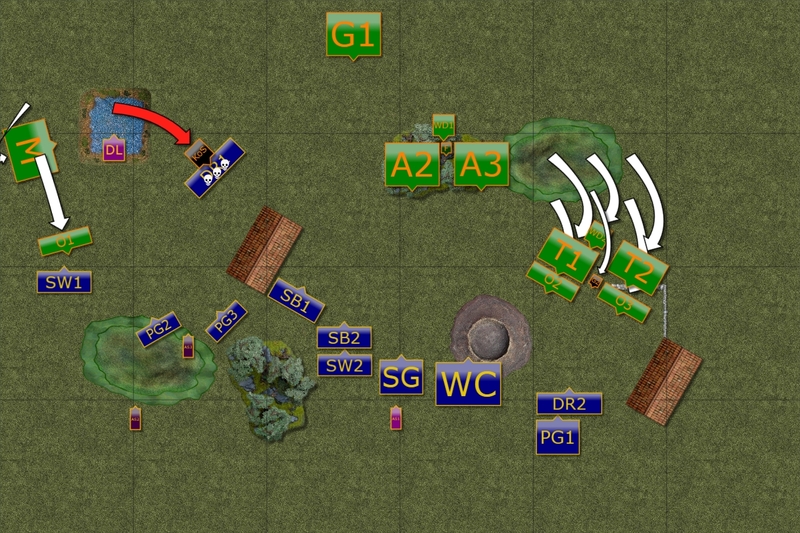 Elves executed their plan on the left flank where they managed to rout powerful enemies. First, Morax got attacked from the front and rear simultaneously and could not hold fast. Second, wounded Krudger got charged by two troops of Palace Guard who defeated this powerful beast! Then, probably as a bit of a surprise, Elves performed a maneuver where Silver Breeze cavalry withdrew and opened the path for Storm Wind knights to attack exposed flank of Greatax regiment. That caught Orcs off guard and they wavered. 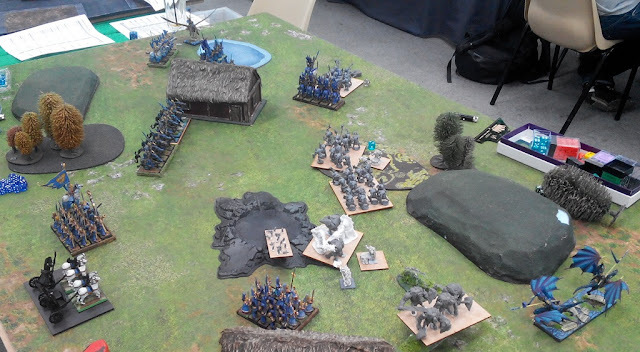 The loss of the units on one flank was bad but Orcs had to press forward. Orclings, inspired by Grumtongue, charged the Chariots and Wavered them! 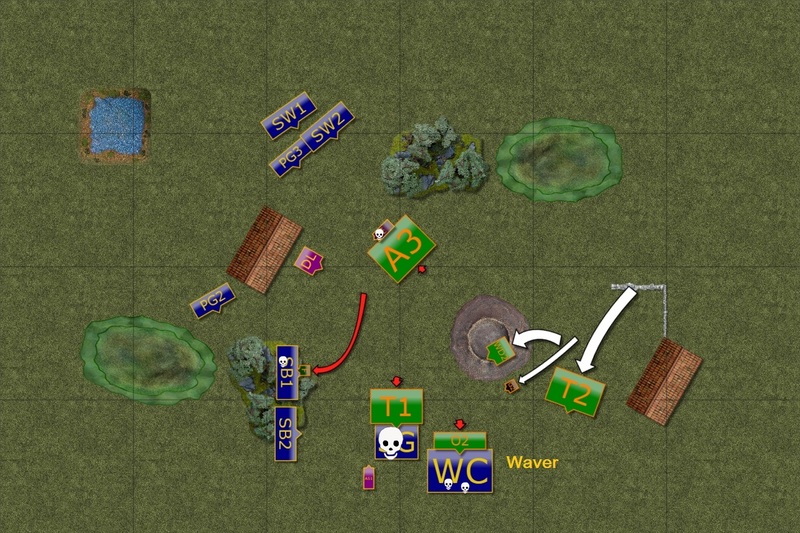 Grumtongue and WarDrum both attacked Palace Guard and inflicted some damage. Attack from the right falters. Elven units on the right flank charge damaged Greatax and rout unsupported unit. 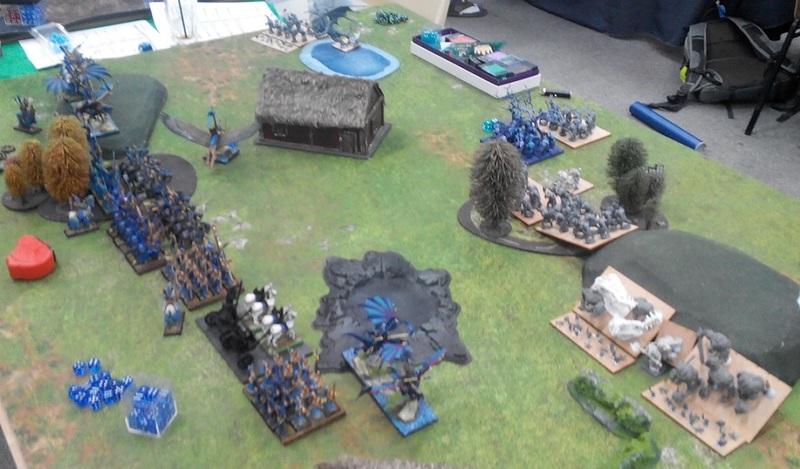 On the other flank, Drakon Riders did not have other units in range so risked attacking Grumtongue. Unfortunately, Elves failed to rout him and were now in a very dangerous position. Elves are punished for their mistakes. As Elves became a bit reckless it was time they would pay for their arrogance. On the right flank, Trolls destroyed Drakon Riders with easy. 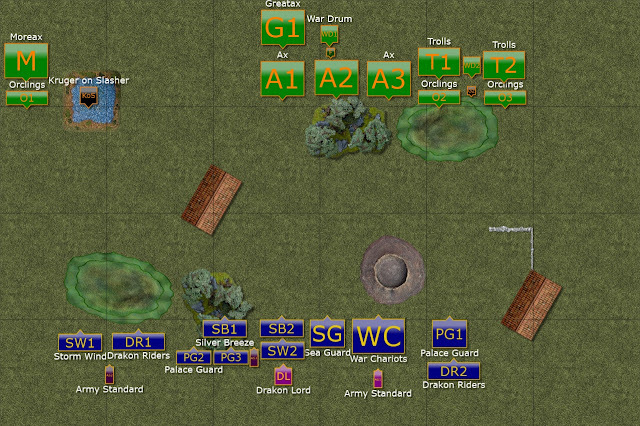 Grumtongue finished Palace Guard too and other unit of Trolls finally could attack Sea Guard. 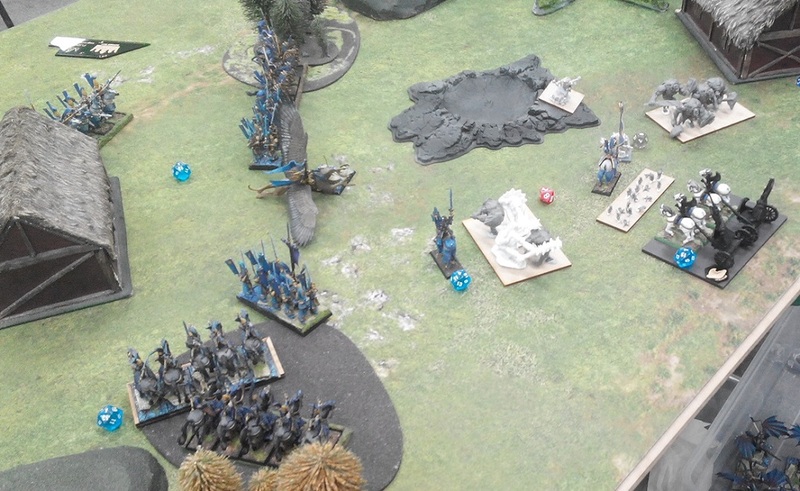 Although the attack was not as powerful as the charge was hindered. 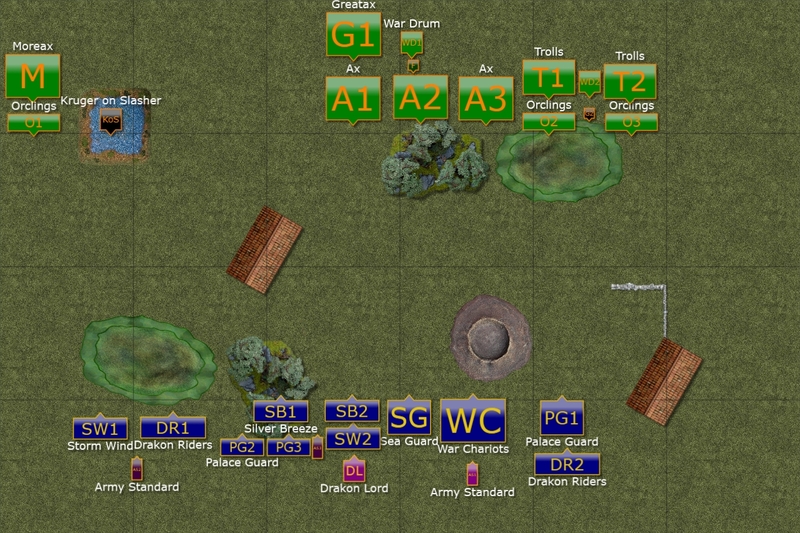 Elves consolidate their positions in the North. 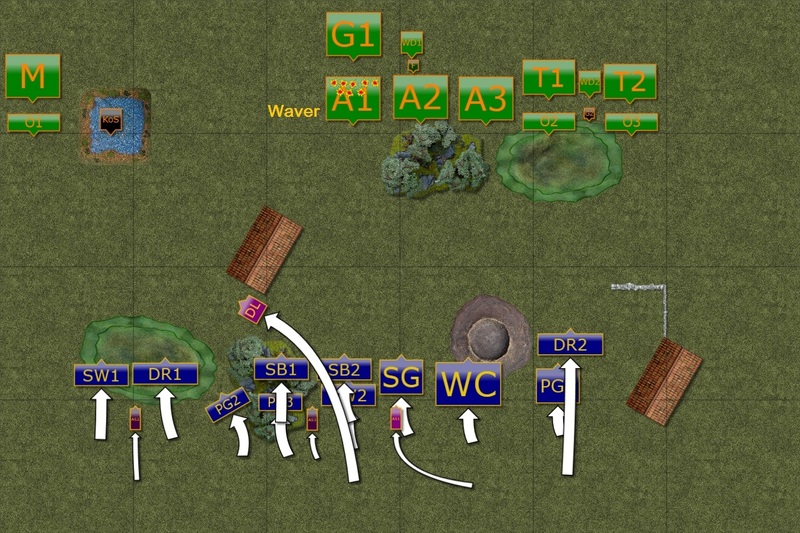 The units attack from the North and more Orcs regiments are routed. Damaged Ax unit could not avoid Elven Drakon Lord who finished them by himself. 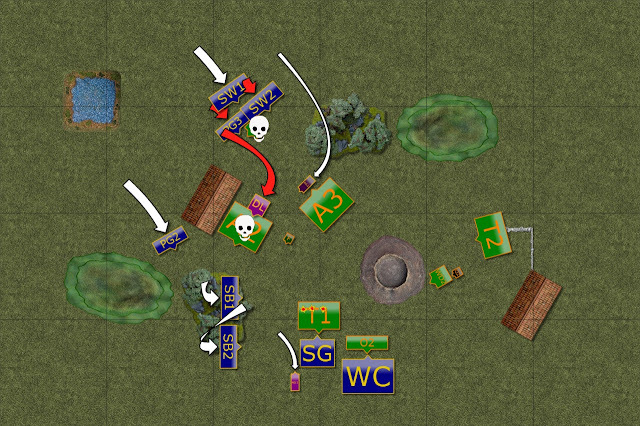 Orcs still had quite a few units left and kept fighting back. Trolls finished off Sea Guard and reformed to face new enemies. Their companions advance to assist brave Orclings who kept hitting the Chariots over and over again. As Orcs did not have enough of the fight the battle continued. 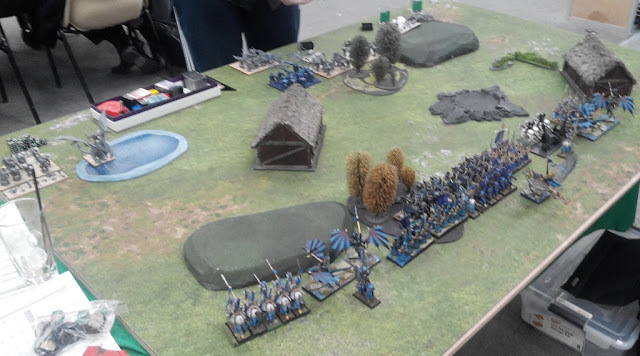 Final charge of the Elven units. 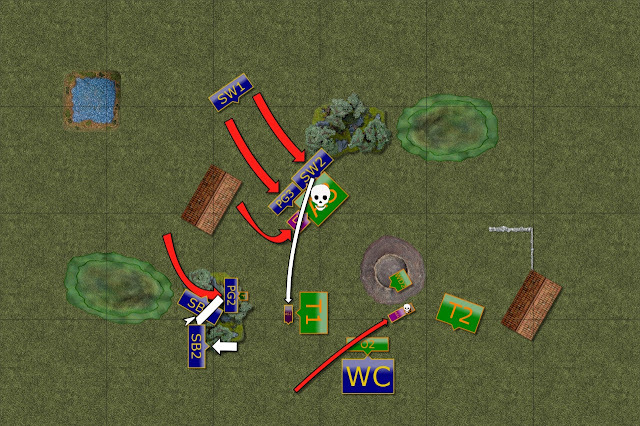 In the last charge Elven units captured the Flagger and routed last unit of Ax. 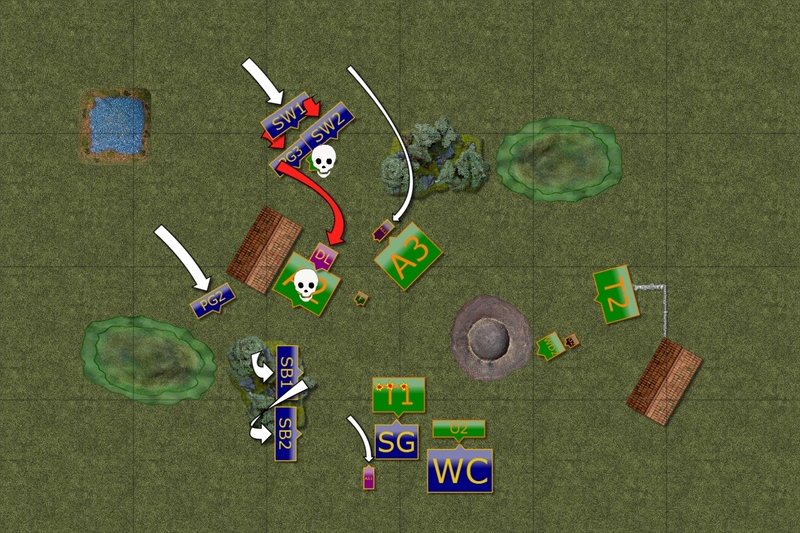 Brave Army Standard charged wounded Grumtongue and even wounded him but could not rout him. Trolls can't catch Palace Guard. In the final act of the battle, Trolls kill the Chariots but are too slow to catch the Palace Guard. Grumtongue got bored with the Elves who avoided straight fight and decided to withdraw to seek some slower enemies. Many thanks to Tas for yet another great game! It is not easy to command infantry based army but in the end he came close to a draw as I think I got only around 300 points more than him. 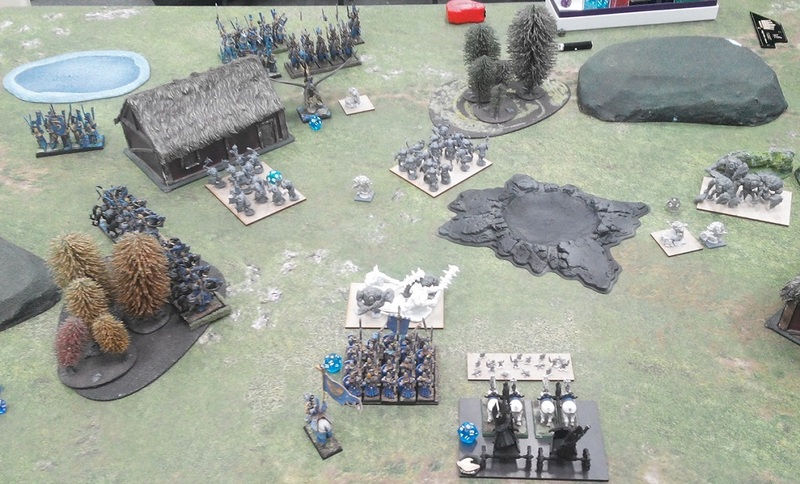 I think if he didn't hesitate with the infantry in turn 3 and simply moved them forward out of the woods and if he kept Orclings in front of Ax units rather than Trolls - this game would have gone his way. 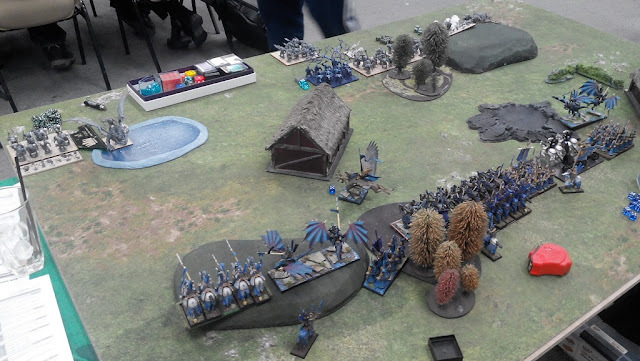 This game also showed very nicely that my army is very fragile. Any mistake is punished immediately. 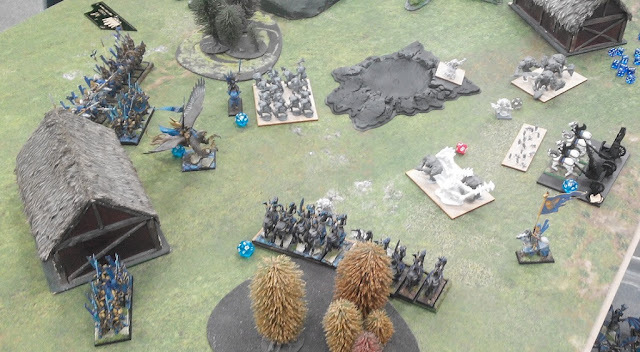 For example, I moved too close to Krudger with my Drakons and while I was happy to exchange blows to keep the beast in place - it was not a planned decision. Bigger mistake was made in turn 4. 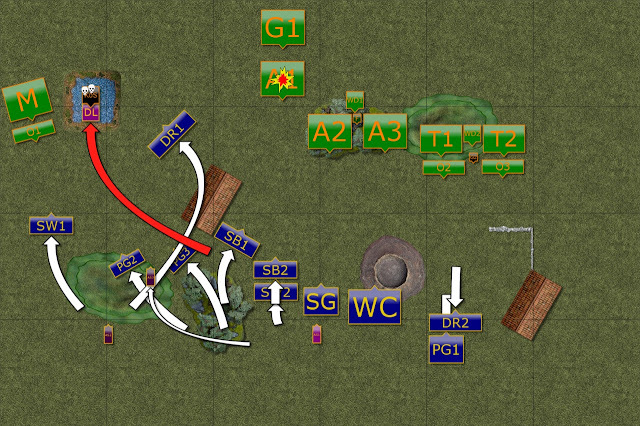 It was quite interesting though because I did well on the left flank, spotted opportunity with Storm Wind against Greatax but completely miscalculated on the right flank. I could do 2 things differently. I could attack Orclings with Chariots. 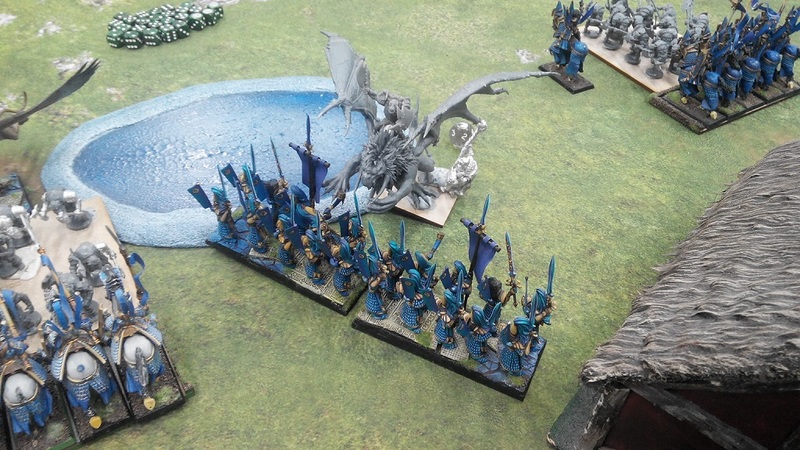 This would help to keep Trolls closer and potentially allow Drakons to charge them from the flank or rear. Or I could be more patient with Drakons and spend one more turn re-positioning. Even if they didn't charge I would at least kept them alive and had a bigger, safer margin of victory.